Egypt's President Abdel-Fattah El-Sisi inaugurated on Sunday the World Youth Forum (WYF) in the country's South Sinai resort of Sharm El-Sheikh. The forum, held from 4 to 10 November, has attracted thousands of participants from around the world, with official delegations from 52 states as well as youth representatives from 113 countries. Before his opening speech, the Egyptian president called on participants to observe a minute of silence for the victims of terrorism and war all over the world. 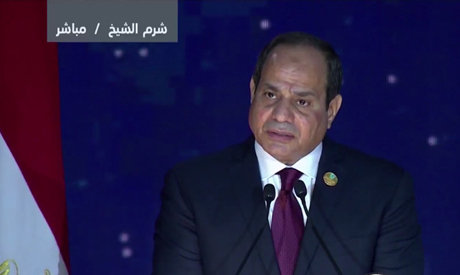 In his speech, El-Sisi praised the Egyptian people for their "tireless work during recent years". El-Sisi also said that the fight against terrorism should be considered a human right, as it threatens to destroy humanity. The Egyptian president stressed that the world is need of reassessing ideas and views that have led to a planet seized by wars and to achieve the dream of a world without extremists. "Egypt, with its Pharaonic, African and Arab roots, will employ all its capabilities in carrying out its historical role in reshaping the ideas of peace and stability," El-Sisi added. A number of state officials and youth representatives gave speeches during the opening session on Sunday evening, including the Administrator of the United Nations Development Programme Achim Steiner, who attended on behalf of the UN Secretary-General Antonio Guiterres. The forum aims to tackle topics of interest for both domestic and international youth, including global issues that concern young people, sustainable development, technology and entrepreneurship, civilisations and culture, creating future leaders, the Model United Nations (MUN), creating jobs for the youth and curbing irregular migration. The forum was first announced in July during the country’s National Youth Conference in Alexandria.